Background: Sciatica is a common complication which is associated with disabilities, miss work, high therapeutic costs, and side effects of medications. In this study, we recommend an alternative treatment based on Persian medicine in the treatment of sciatica. We aim to consider the effect of FASD (Blood-letting), which has been suggested as an effective therapeutic method for articular and sciatica pains in Persian medicine, in the treatment of sciatica. 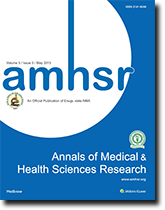 Material and Methods: In this randomized clinical trial study, the therapeutic effect of FASD was considered on 50 patients with sciatica in Tehran within the year 2017. Patients were randomly divided into two groups: diclofenac (50- 100 mg based on their body weight, n=25) and diclofenac (50-100 mg based on their body weight + FASD, n=25). Results: In this survey, 76% of patients were male and 24% were female. There was no significant difference in mean of basic demographic data between two groups. Patients who received combined therapy with diclofenac + FASD showed better scores of pain (45.43 vs. 3.6; p<0.001), mental health (17.4 vs. 2.04; p<0.001), quality of life (32.79 vs. 4.29; p<0.001) and Roland Morris score (13.92 vs. 2.28, p<0.001) compared to the diclofenac group. Conclusion: According to the traditional medicine and findings of the current study, FASD can be considered as an effective method for the treatment of articular pains and sciatica.